Melt butter and olive oil in a sauté pan over medium-high heat. Brown chicken on both sides, then transfer to slow cooker. In sauté pan, add diced onion, carrots, and celery. Stir and cook over medium-low heat until softened and fragrant. Add half of the chicken broth. Stir to combine. Pour mixture into slow cooker with browned chicken. Add potatoes and remaining chicken broth, cover, and cook on low for 6 hours. After 6 hours, turn the crockpot heat onto high. Remove chicken breasts from slow cooker. Using forks or kitchen tongs, lightly shred the chicken breasts (this should be easy since they have cooked so long.) Return chicken to crockpot. Add ½ cup of cream, then cover while you make the dumplings. In a bowl, combine flour, sugar, baking powder, salt and pepper. Crumble in butter with your fingers and rub into the flour until evenly dispersed and coarse crumbs form (use your hands to mix the two together well). Add in cream, stirring well just until a sticky dough forms (if dough is too dry, add a little more cream or milk until a workable consistency, but not too “wet”). Use a tablespoon measure and add small scoops of the dough into the crockpot, starting by placing them around the outside first, then the inside. Cover and cook for another 1½ – 2 hours, until dumplings are cooked but soft and no longer raw in the middle. Taste and season additionally, if desired. Serve immediately. The heavenly magic of the mixture of Onions, Carrots, and Celery – known as a “mirepoix” in French cooking – is a true culinary staple. I cannot stress how important these three ingredients, acting together, are to enhancing the flavor and aroma of any “comfort food” dish. Be sure and add the cream to the chicken mix – it won’t make it too creamy, but it will add just the right amount of richness to the broth. Don’t skimp on the dairy ingredients in the dumplings, either – use real butter and heavy whipping cream to make the dumplings; it makes them out of this world good. 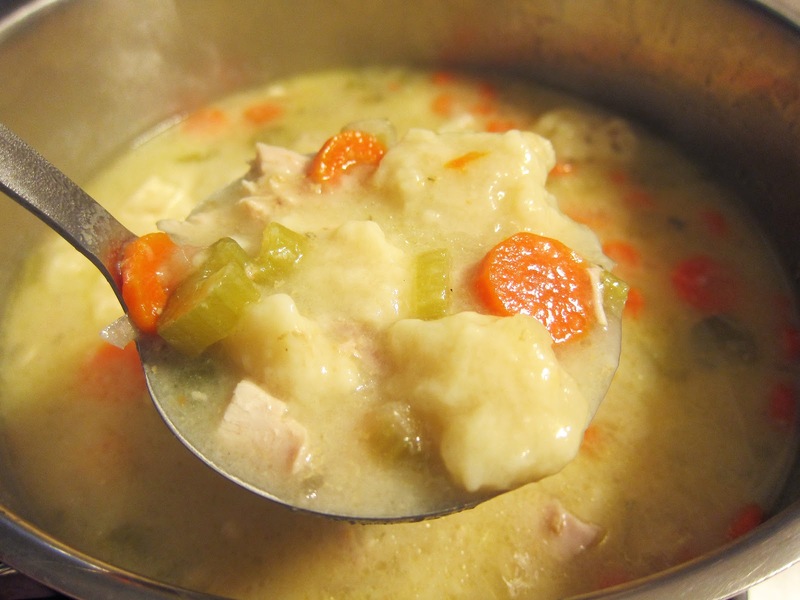 This entry was posted in Family, Recipes and tagged Chicken and Dumplings, Crockpot. Bookmark the permalink.